Come sit a spell on my porch with your sweet tea and I will spin you a yarn! Kentucky country life is fast paced yes, but when it is time to unwind, these folks have stories to tell! I have met some of the most creative, colorful people of my life in KY. It makes perfect sense that Mary Hamilton would be able to pass down some of her oral stories into published form, to keep the ball rolling. Who doesn't love a good ole folk-tale? This book has stories about Daniel Boone, farmers, hunters, dogs and more. I can just visualize the story teller captivating the audience with her tales. None as great as hearing first hand, but well done in written form as well. This is the perfect book for reading aloud to the family on cold fall evenings. The first section does have frightful and creepy tales, so you can skip over those for the young ones. Story telling in the hills of Appalachia, that is certainly Kentucky to me! 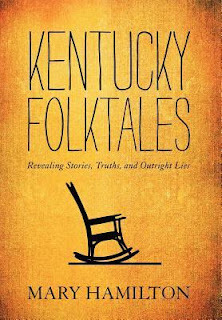 Enter to win a copy of this book Kentucky Folk Tales! Use the Raffleocopter for entries. Be sure to check out the other great KY giveaways on my left sidebar. I used to live in Charleston and fell in love with all things Gullah, especially their stories! I've read a handful of stories and Folktales and found them to be really interesting and insightful. The world is so diverse and these stories are a great way to discover what many value in other cultures and subcultures. Most of my experience with folklore is from school, but I still remember some of the stories. I was born and raised in the foothills of N.C. Folktales has always held a special interest for me, even though I don't live near the mountains anymore. Mine would be from my grandparents. they would love to tell big tales especially my granddad. Well, I'm from Kentucky so I grew up listening to tall tales! My daughter has always been fascinated with folktales and urban legends. For her October birthday, she wanted to go on a haunted Atchison tour. We had a lot of fun listening to the stories. My grandparents always told excellent stories... I had a Blackfoot Indian Grandmother, a German Grandmother..a German/Polish Grandfather..Dutch/Irish/German Grandparents..so I heard many many tall tales and stories.I didn't realize until after I was in the 5th grade or so that the stories they were telling weren't stories they'd made up...lol.. I've always loved reading about it and my parents told me some stories. Grew up reading and listening to them.